Prague. The word conjures up images of spiky gothic buildings, ancient stone bridges, towers, quirky statues and cobbled squares. 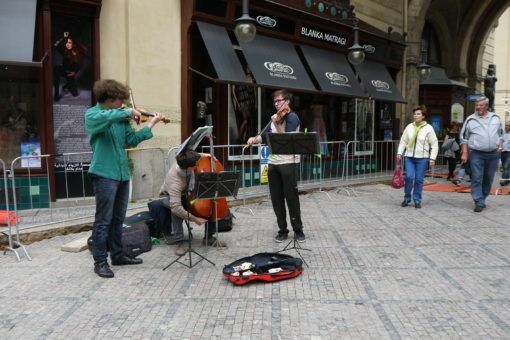 I remember the cacophony of music that followed us around during our trip to Prague, as well as the screech of trams and the taste of cinnamon chimney cakes. 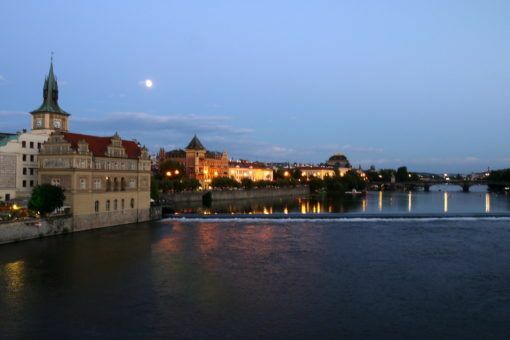 My lasting memory is of the sun setting over the river with Prague’s hilltop castle glowing softly in the distance. How much did I love Prague? Let me count the ways. Prague was the last destination on our tour of Eastern Europe and it immediately became our favourite stop. Joined by my friend Jo, we spent five days exploring the city. 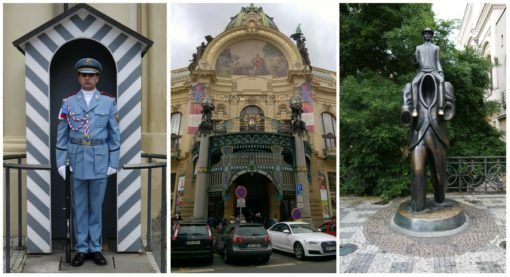 Here are 10 of the reasons I fell for Prague. Prague’s energy sucked me in straight away. I loved being one of an anonymous crowd as we explored the streets, feeling life buzz around me. Prague felt steeped in another age; around every corner lay yet another Baroque or Gothic building with black spikes and stone towers. Everywhere I turned there was music and food, a festival or street show, creaky old pubs and antique-shop-lined alleyways. Trams trundled through the streets and boats chugged along the river, endless streams of sightseers flowed over the Charles Bridge towards the peaks of Prague Castle. I got totally lost in the infectious energy of Prague, the pure essence of a city dripping with history yet thrumming with modern-day life. 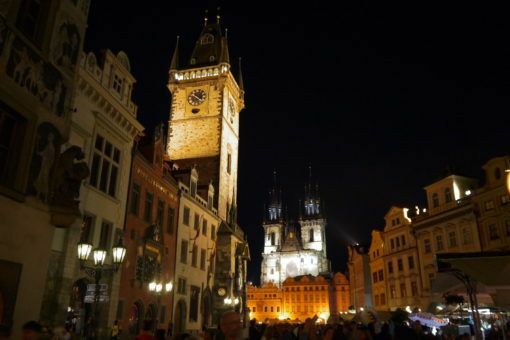 Prague’s streets are bursting with over 1,000 years of architecture which stands miraculously untouched by war. When it comes to European architecture the city has it all. 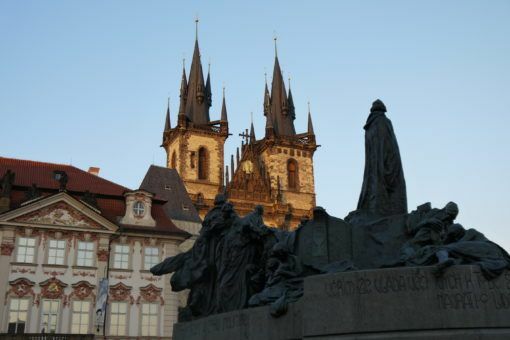 From Romanesque structures built during Prague’s days as the Capital of the Roman Empire in the 14th Century, to Art Nouveau and Cubist buildings as well as Neoclassical designs like the National theatre. 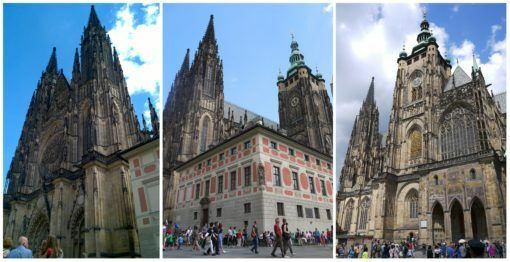 I don’t know a whole lot about architecture, but my favourite buildings were Prague’s Baroque and Gothic beauties: the Charles Bridge, St Vitus Cathedral, St Nicholas Church and the twin-spiked Tyn Church which dominates the Old City skyline. I also loved the Town Hall with its ornate astronomical clock, the oldest operating one of its kind in the world. We joined the crowd to watch as the clock struck the hour and a parade of 12 apostle puppets emerged to nod at the spectators. 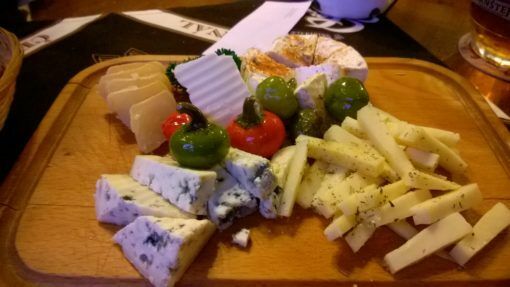 On our first evening in Prague we sipped pints of Pilsner that cost less than £1 and enjoyed a delicious snack board of cheese, homemade crisps and bread for just £6. 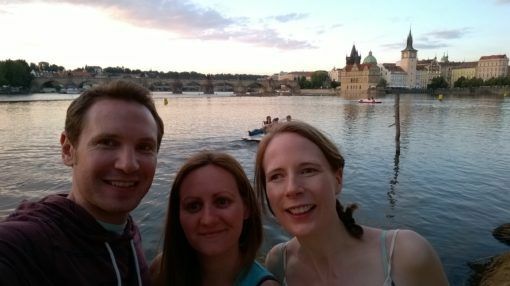 We went to the supermarket for cheap lunches but ate tasty dinners at vegetarian restaurants or traditional Czech pubs for between £14 and £18 for two people. Our Airbnb room in Prague cost just £17 per night and our host sold us monthly tram passes which gave us both unlimited travel around the city for under £2 per day. 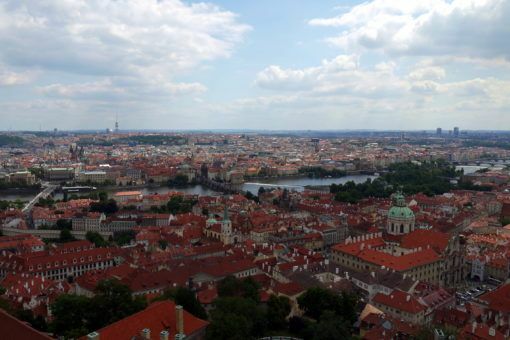 Sightseeing in Prague was mostly free but we did pay £4.70 each to climb St Vitus Tower. Our daytrip to see the Bone Church in Kutna Hora included a return train fare of £5.70 each and £2.80 in entrance fees per person. 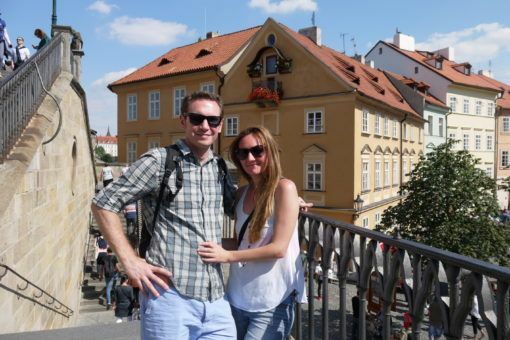 Considering how much we loved Prague, we thought it was great value for money. 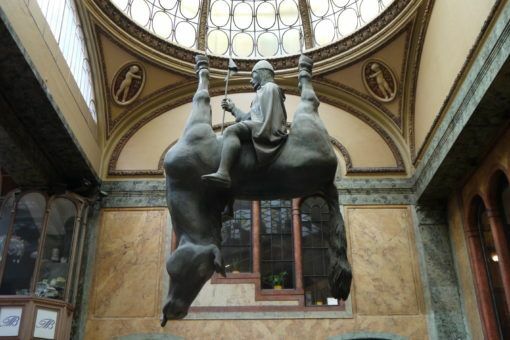 Whilst exploring Prague we stumbled across plenty of quirky statues. 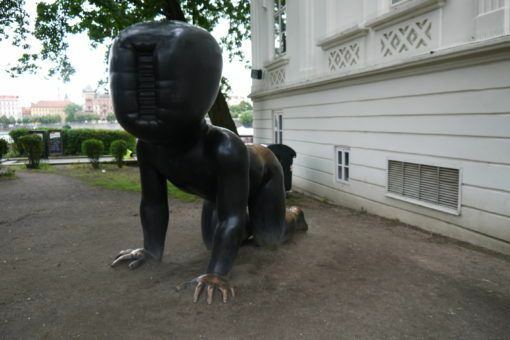 Outside the museum in Kampa Park there are three creepy, faceless alien babies. In the Jewish quarter there’s a statue of Franz Kafka sitting on the shoulders of a headless man, inspired by a description in one of his short stories. 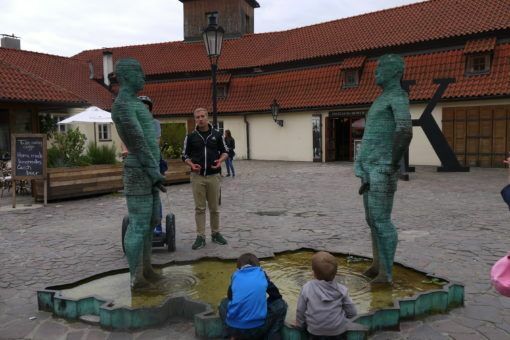 We also saw the ‘Piss’ statue of two men peeing into an outline of the Czech Republic and the controversial Dead Horse, which shows St Wenceslas riding a dead, upside-down horse. Sadly we missed many more strange statues, including The Man Hanging Out statue of Sigmund Freud dangling from a tall building, those creepy alien babies crawling up the Zizkov TV Tower, a giant pregnant silver woman and a memorial to the victims of communism, which consists of seven broken men descending a staircase. Prague’s ancient castle sits on the left bank of the River Vltava and is the largest in the world, covering an area bigger than seven football fields. 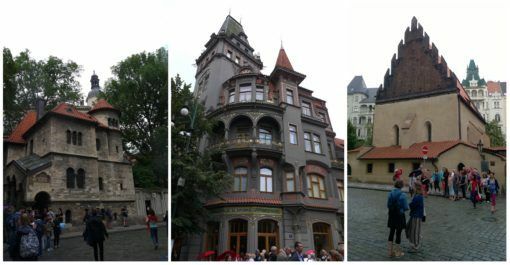 The castle is comprised of a collection of museums, gardens, historic buildings, galleries and the towering St Vitus Cathedral. 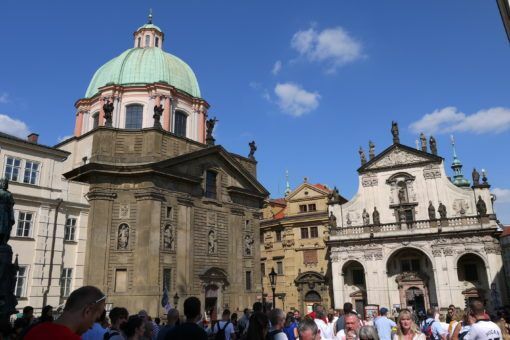 We didn’t buy a ticket to get into all the various buildings in the castle, which cost between 250 and 350 Czech Koruna (£8 – £11) and included entrance to various exhibitions, the Golden Lane, Basilica of St George and the Cathedral. Instead, we were content to wander around, taking in all the sights from the outside. We did, however, pay to scale a spiral staircase to the top of the South Tower, which gave us panoramic views of Prague bisected by the river in the distance. 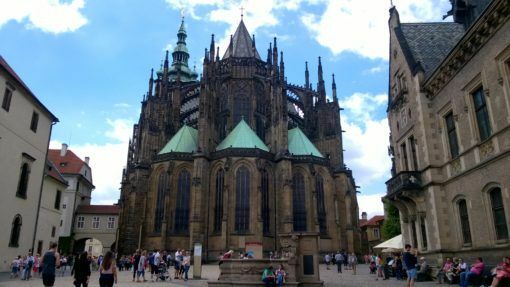 St Vitus Cathedral was undoubtedly the most impressive, fairytalesque castle I’ve ever seen with its triangular spikes and circular swirls and mix of Gothic, Renaissance and Baroque features. It’s hard to take in the sheer scale of St Vitus, so we circled around the building, examining the clock face, tower, gargoyles and patterned roofs. Czech food is traditionally meat-heavy, stodgy and hearty; think goulash and sausages, roast meat and thick soups, potatoes, dumplings and cabbage. 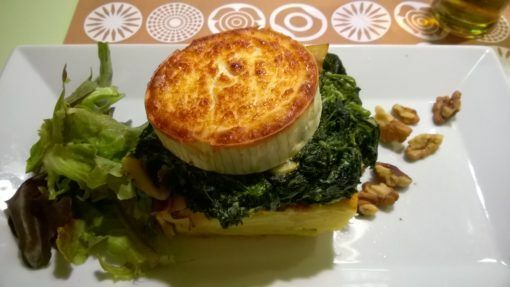 So, you’d think a vegetarian like me would have had trouble in the city, but actually I enjoyed some seriously tasty meals during our trip to Prague. We found some amazing vegetarian restaurants, including Estrella, which was tucked down a quiet stone alleyway. 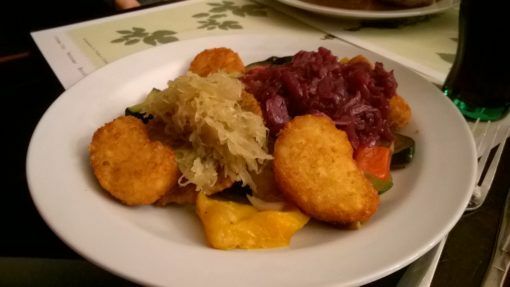 I even found a vegetarian plate of rostis and veggies at U Fleku, one of Prague’s oldest breweries and restaurants in the city. 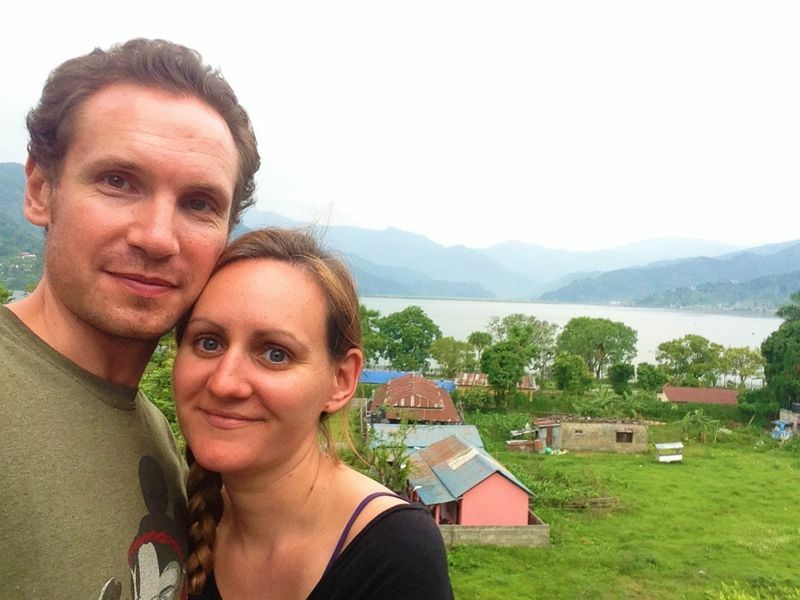 Andrew and Jo tried out the goulash and roast sausage. 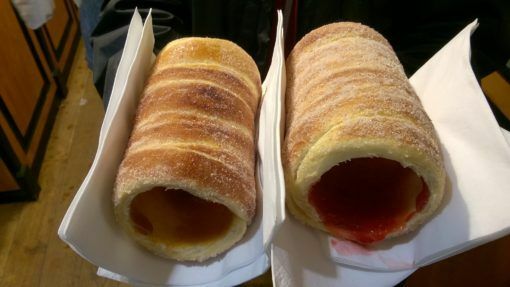 We also had to get a taste of the Czech pastry Trdelnik, or Chimney Cake, which is a tube of warm, cinammony dough filled with jam and cream. 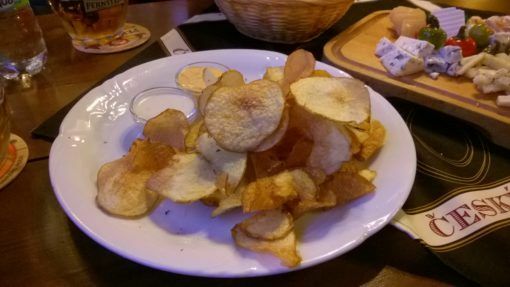 Pub snacks like homemade crisps and local cheese were also unbelievably cheap and tasty. 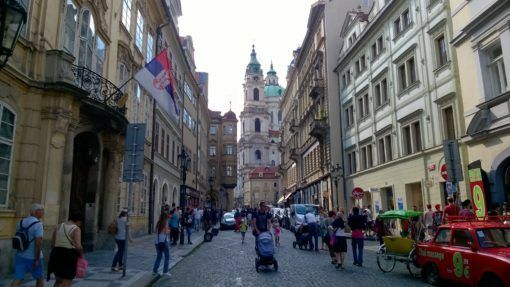 On our first day in Prague we were drawn through the city from one grand building to the next, through packed squares, cobbled side streets, across bridges and alongside the river. Everywhere we went there was music; violinists, rock bands on boats in the riverside student area, accordionists at a brewery and a live band at a French Bastille day festival. In the Old Town Square we were drawn into St Nicholas Church by choir song. We sat for almost an hour listening to the haunting vocals, which rebounded around the Baroque swirls, chandeliers, murals and gold-tinged statues that decorate the church. Darkness fell as we walked across the Charles Bridge, accompanied by a busking string orchestra. 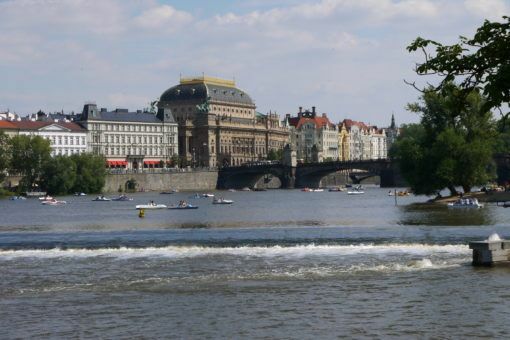 The Gothic-style Charles Bridge stretches over the river Vltava through an archway to a sloping street lined with ancient buildings. 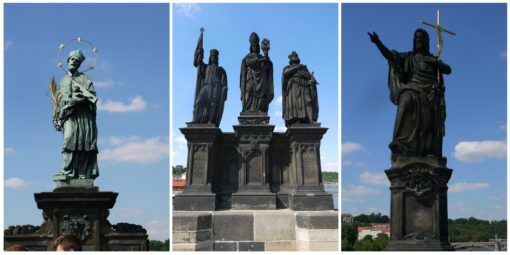 The Charles Bridge is lined with Baroque statues and lit by orange lamps after dark. On one end sits a black-topped tower. No matter what time of day or night you visit, the bridge is bound to be packed with people, buskers, sketchers and stalls selling trinkets. 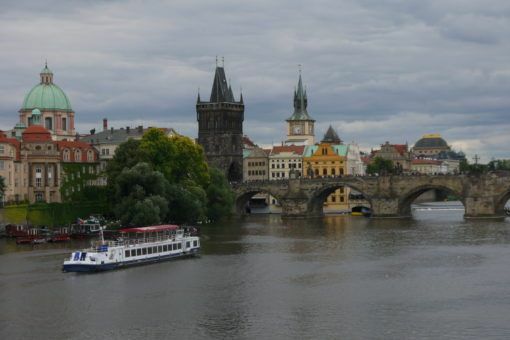 Even though it was busy, I never got tired of walking across the Charles Bridge, taking in the views of the river and the various pinpricks, domes and towers that make up Prague’s skyline on either side. After dark, Prague Castle glows with warm orange lights and boats drift up and down the river while the moon reflects off the surface of the water. It’s one of the most atmospheric places I’ve been. 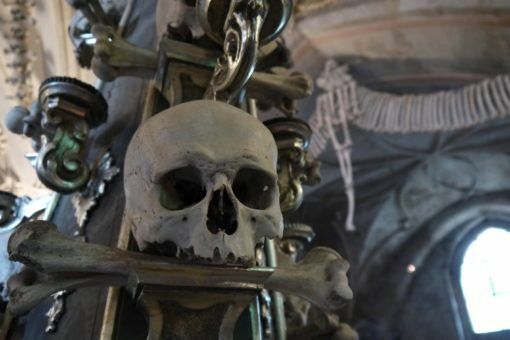 We took the train from Prague one morning to visit the famous Sedlec Ossuary, which is also known as the Bone Church. 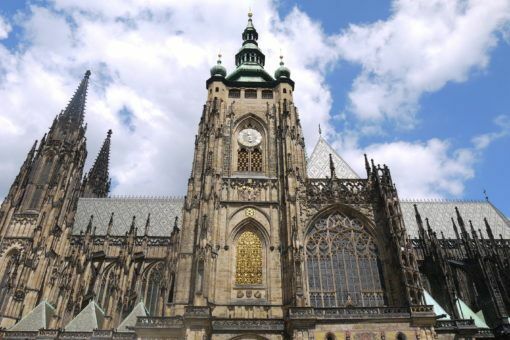 This extraordinary building is one of the Czech Republic’s World Heritage Sites and most-visited buildings. The inside is decorated with the bones of up to 70,000 people which have been arranged into elaborate displays such as skull towers and chandeliers. You can read more about our trip to the Bone Church here, it was one of the most unique religious building I’ve ever visited. Sadly, we only had time to see a few of Prague’s public parks. We rode the funicular railway to Petrin Hill, where we bought an ice cream and strolled around the grassy hilltop, stumbling upon a mini version of the Eiffel tower. 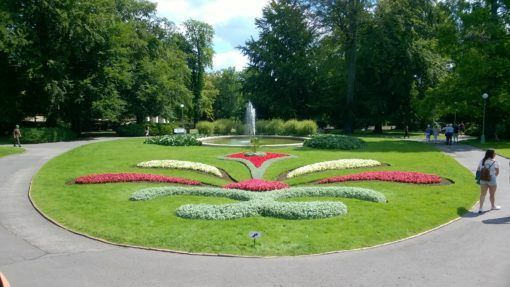 While visiting Prague Castle we took a peek at the manicured Royal Gardens and later spent some time with the peacocks and riverside views in Vojanovy Sady park. On our last evening we headed down to Strelecky Island, a peaceful patch of greenery where we watched the sun start to set. Pedalos cut across the water and the Charles Bridge sat proudly in the background. The light was golden and pink-tinged, the perfect end to our time in a city we both hope to explore again one day. 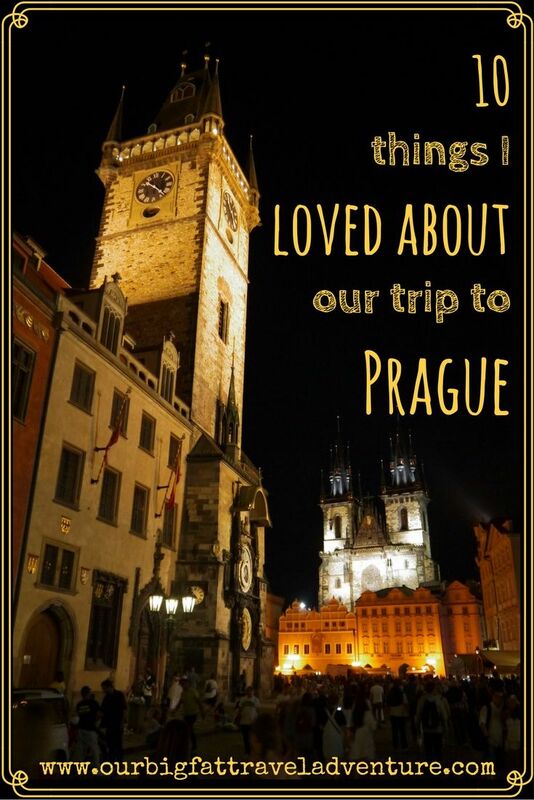 Have you been to Prague; did you love it as much as I did? 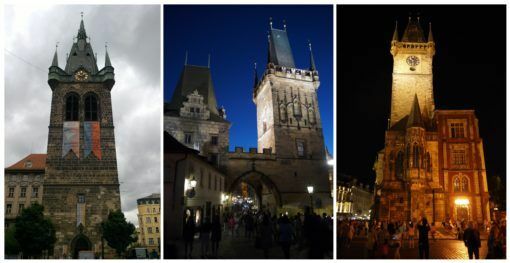 Love the descriptions and the photos, another city to add to the list… You’re singlehandedly responsible for about half of my “must visit” list now. Thanks James, I’d definitely recommend Prague. You Guys could head over there for a few days around Christmas time when you’re back in Blighty, the xmas markets in Prague are supposed to be epic! 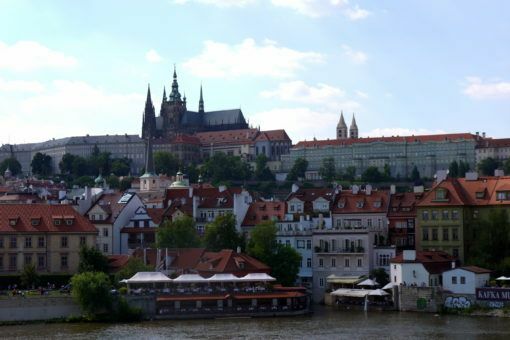 I’m going to Prague in February and am so excited now after reading this post! I can’t wait to see the architecture and soak up the culture. I’ve heard this is a good time to visit if yo don’t mind the cold weather. The crowds are usually much thinner and visitors can get good deals on airfare and hotel rooms. The Prague astronomical clock, is a medieval astronomical clock located in the centre; first installed in 1410, making it the third-oldest astronomical clock in the world and the oldest one still operating. Hi Cara, thanks for commenting. I think February sounds like a great time to visit. We loved it in Prague and would gladly return in the off season. Have a great time! Glad you loved the City so much- I preferred Budapest myself but Prague does have a lovely charm to it! Plus we went to our first cat cafe there which gives it major points! I loooove Prague so much! I really want to go back one day!! And omg yes the food! PS. You guys took some nice pictures 🙂 Really takes me back! Thanks Loes, glad we brought back some nice memories for you 🙂 We have been trying to improve our photography, but it’s a slow process! I loved the vlog, it captured well the highlights of your time in Prague. So nice that you had your friend Jo to explore and enjoy this great city with. I laughed at Andrew ordering a beef burger whilst you and Jo opted for vegetarian ? Hi Gilda, glad you liked the video. It was actually a Beet burger, as in Beetroot, but it doesn’t come across clearly in the video 🙂 We had some delicious food in Prague and I loved everything about our time there! 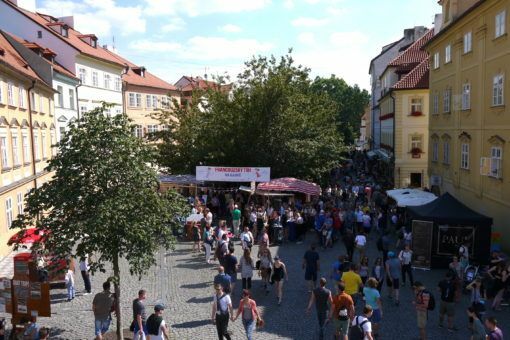 I’m going to Prague in December during a week of Christmas Market hopping, and am now even more excited. Where did you guys stay in the city? That sounds amazing Kristen, we were talking about how much we’d love to do a Christmas market trip to Prague. We stayed in this Airbnb place, which was basic but lovely and the host was amazing: https://www.airbnb.com/rooms/3200655 Have a great time!